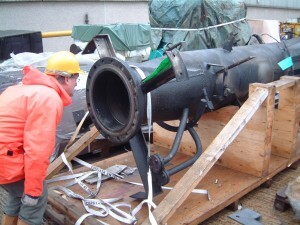 Prior to any flare refurbishments a flare would always be subjected to a thorough workshop inspection. This would be performed after removal of all damaged and degraded materials which are determined not to be suitable for reuse. From here the remaining components are fully shot blasted, degreased and cleaned prior to being subjected to full visual inspection and NDE. NDE levels are agreed with the client but typically are 100% DPI and a minimum of 10% X-ray but this would be enhanced for critical areas. For variable slot Coanda flares the spring characteristics (and thus pressure/flow) are checked and documented. All the inspection results are then used to enable the flare refurbishment work scope (including any upgrades) to be well defined. In parallel to the pre-refurbishment inspection, or as a separate report, Argo Flare Services can undertake a failure analysis service. The scope of this service is agreed with the client and can include metallurgical analysis. This service is used by clients who wish to have a better understanding of their flares failure mechanisms. This can be particularly advantageous if the client is pleased with the operating characteristics of the flare, and does not want to go through the process studies required for a change of flare type. Resultant detail design changes, along with material upgrades, are incorporated to extend the expected service life. We are equally happy to visit client’s premises to inspect flares that have been in long term storage prior to installation, or to provide advice on the overall condition of a removed flare.